Barbizon Midwest Review: SPECIAL OLMPICS & BARBIZON--2GETHER going for the GOLD!!! SPECIAL OLMPICS & BARBIZON--2GETHER going for the GOLD!!! 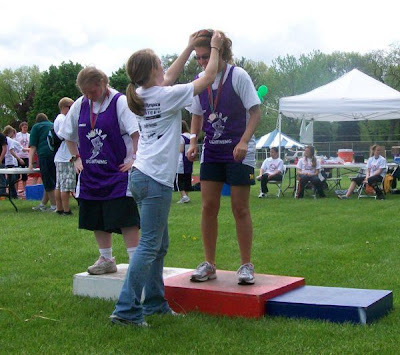 For the past four years Barbizon Midwest has been a proud sponsor of the Special Olympics Spring Games held at Prospect High School in Mount Prospect, IL. On May 2, 2010 we broke our own record with over 50 volunteers. Everyone had a great time helping out with different events that include Track & Field, Ball Toss and Long Jump. Our volunteers assisted the athletes to their competitions and proudly handed out awards from the podium. The friendships that were developed between the volunteer and the athletes were and still are amazing! Our Barbizon students and graduates can’t wait to do it again next year! Barbizon has been committed to helping young men and women go through life with pride and self assurance since 1939!